The sombre blacks and greys of NOTHING’s cover give away nothing. But even a health warning might not be sufficient to prepare you for the terrible beauty that is born (apologies to Yeats) in the cosmic explosions that are Frances Aviva Blane’s paintings. A stunning design by Joe Corr features 12 paintings and 6 drawings on paper, mostly made in 2015, in a large-format, magnificently-produced picture book. Accompanying the art is an essay by the famous biographer Diana Souhami and Blane’s own thoughts and reflections. Blane insists the work comes from nothing. A provocative statement which can be variously interpreted – just like the word “nothing” itself. Indeed, the notion that art (or anything else for that matter) can come from nothing is a mental challenge, first put forward by Parmenides, the Eleatic Greek philosopher who pondered the mysteries of the cosmos and thought even before Plato and Socrates. Those familiar with Blane’s work will know that she usually works on a huge scale. But in this selection, the largest paintings are 60cm square and the smallest work, Desert, is 29cm square. Has the reduction in scale led to a loss of intensity or power? On the contrary. 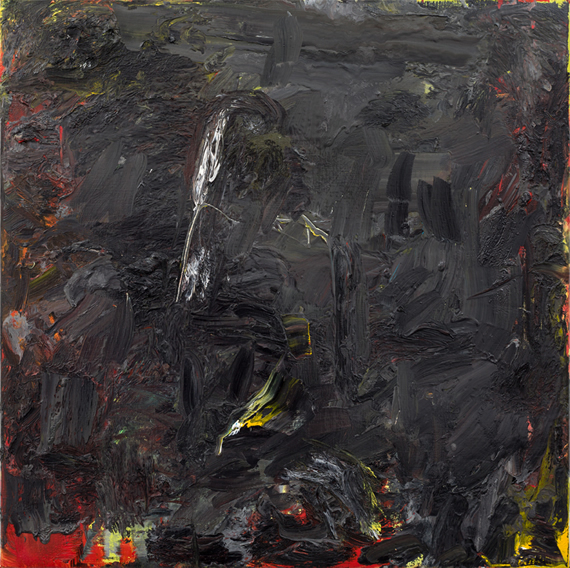 Victor, a mass of fiery reds, pinks, flesh tones, black scribbles and streaks of yellow, defies comparison. It’s not a “depiction” of anything. At its beating centre is a volcanic eruption spewing oxblood reds, capped by white foam. This furious chaos is offset by a pattern of dribbled lines around the edges, where the paint is thinner and calmer. In the middle, a scratched doodle floats on the very surface of the paint, whilst blacks and reds seethe in and out of strange depths. Victor has an out-of-control feeling, but the dribbled hatched lines enclose the event. On the reverse of the same heavy page, is a close-up of Stuck. It’s an abrupt switch from the high energy of light and colour to the absorption of dark matter and the beauty of intense blacks, as your eyes are lost in a sea of soft and silky brushstrokes. How many blacks can there possibly be? Mars, ivory, lamp... the list goes on. They are intensified by glimpses of red, while touches of white hover and flow in and out of the morass of marks. Underneath, layers of reds and greens shine through. 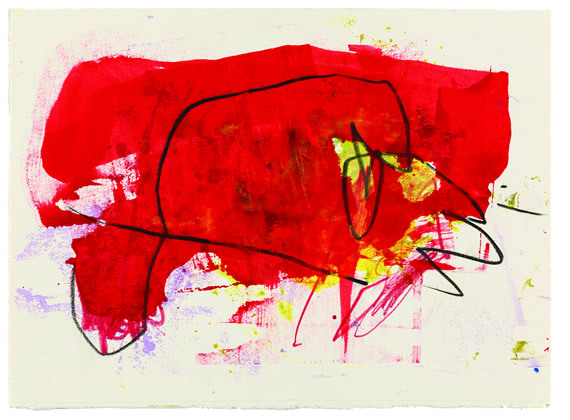 The words – “I always take control” – are set opposite a beautifully stark drawing on Fabriano paper called Red, which, unusually, has a landscape format. A bold red makes a bulky shape, with loose charcoal lines playing around like a cowboy’s lasso trying to rope in a bull. 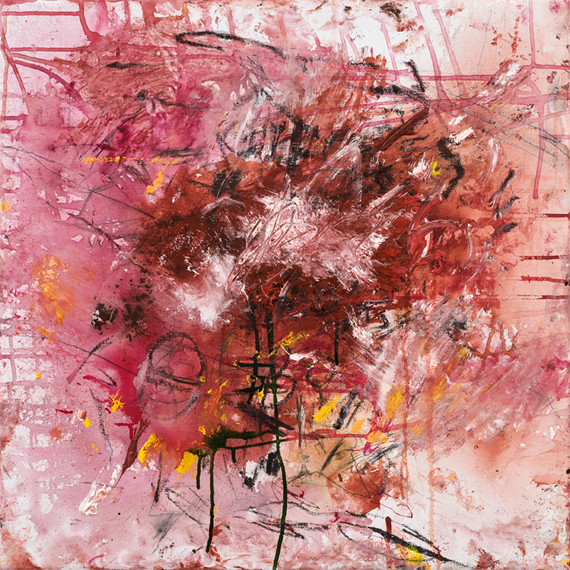 It is reminiscent of the Informel movement of the 1950s – the European counterpart of Abstract Expressionism – with its focus on improvised gesture and feeling for substance. Titles are ambiguous, with different meanings evoked by a single word: Fall, August, Desert, Stage, Pitch, Interior, Stuck, Victor, Note, Sheet. The latter work is clearly a sheet of handmade rag paper, “ruined” by blotches and scribbles. The acrylic paint is thinned out, fading from intense blood red to a pale mauve. The marks are complex and suggestive. 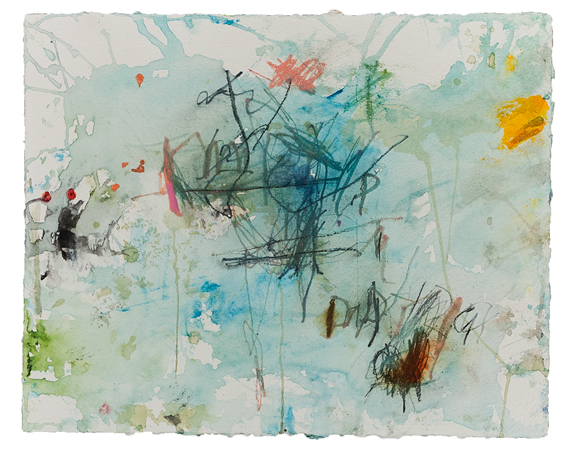 This wealth of allusions is equally true of Note – where the lightest of blues are washed on to Two Rivers paper. It could be a rubbed out message written on a piece of notepaper. The watery marks could be tears. Musical references are strong, with blues punctuated by staccatos of red and yellow. In a literal sense, most of these works are indeed “about nothing”. They are not descriptions or images of something other than themselves and the meanings which we would give. 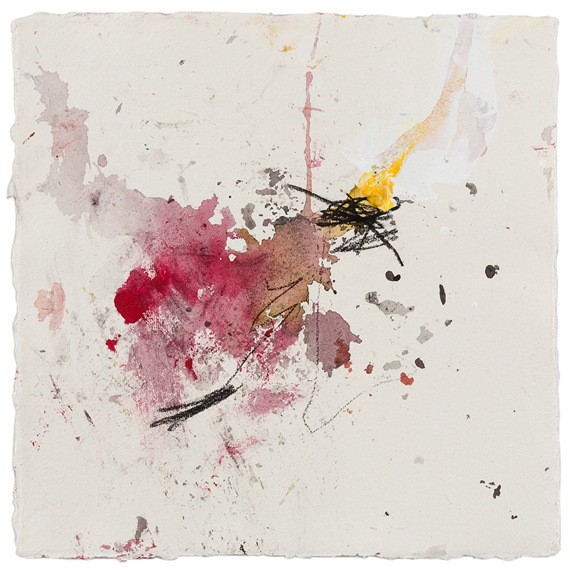 Blane comes close to representation only with her Heads drawings and paintings for which she is perhaps best known, including her Jerwood Prize Drawing, Friend Susie, one of 60 selected from over 3,000 entries. In that, as well as in August, which closes this book, there is a destructive impulse as she walks a fine line between beauty and horror. A tortured sense of physical obliteration brings her close to Francis Bacon. It recalls André Breton’s assertion that “beauty will be convulsive or it will not be at all”. Souhami’s eloquent introduction captures the artist’s no-nonsense, contrary approach, and the evident pleasure she takes in puncturing airy-fairy idealism about art and life, and how personality and work method become conjoined. Blane has learned how to give free rein to her materials whilst at the same time retaining control of her judgement – “when and how to intervene, when to stop”. That brings us back to philosophy. The moment of judgement allows an original concept to determine itself out of itself in a dialectical way, as Hegel explained. There can be no movement from “nothing”. 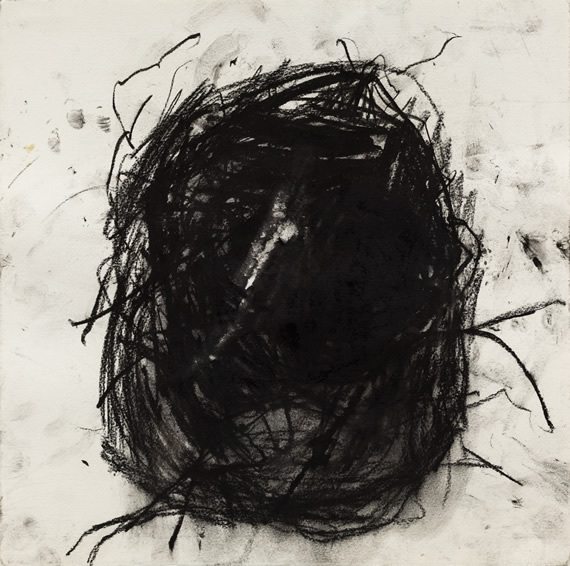 But, along the journey of uncompromising abstraction, whether in thought or in art, there are indeed moments of not-being, of nothingness, as something new comes into existence before our eyes, reflecting the person who has made it and the world in which she lives. There is a negated content in these highly personal, wrenching works. They are cries of pain, but equally and perhaps strangely, an assertion of human strength in response to our troubled times. 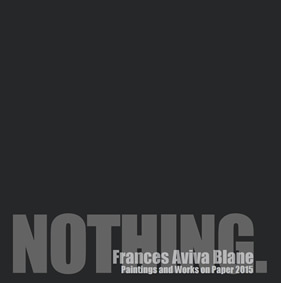 NOTHING – a book by Frances Aviva Blane with text by Diana Souhami is published by Starmount at £50. Available by emailing joe@thepaperboat.com and from Amazon in 2016. A hi-res PDF of NOTHING can be downloaded from the De Queeste gallery website.